Académie launch maximum hydration duo ahead of A/W! | SHEmazing! 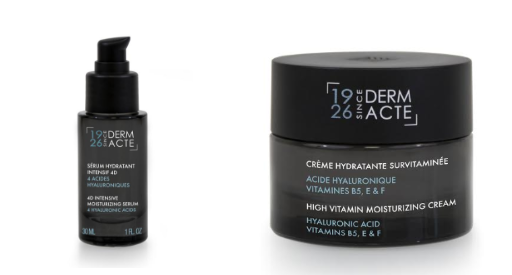 Académie launch maximum hydration duo ahead of A/W! Struggling with dry skin after your summer holidays? We’ve found you the ultimate hydration products that will keep your skin healthy and regenerated all day long! We have always been huge fans of Académie. They prioritize professionalism and maintain high standards when it comes to their products, and we can’t recommend their newest skincare creation enough! Hydration is the queen of all key beauty gestures. Once we hit our 20s, our skin starts to lose elasticity and become flaky. The daily struggle of keeping our skin hydrated and moisturised can become such a chore, but the launch of Académie’s 4D Intensive Moisturizing Serum (€55 – 30ml) and a High Vitamin Moisturizing Cream (€55 – 50ml) has majorly given our skin a much-needed boost! This fantastic DermAct duo for dry skin unveils a plump and high definition complexion: no more worries of itchy, inflamed skin and fine lines which are exaggerated without moisture. Maximum hydration is an important part of a maintaining a healthy, radiant complexion. Thanks to Académie’s encapsulation technology, their highly concentrated active ingredients penetrate deep into the skin with a team effort ensures optimal hydration all day long. Problem solved! With the combination of 4 different hyaluronic acids, this 4D Intensive Moisturizing Serum gives your skin a new dimension through silky high precision and non-invasive filling treatment. Gain a whole cocktail of vitamins for your skin with this High Vitamin Moisturizing Cream, inspired by facial mesotherapy in aesthetic medicine. Deeply hydrated, the skin is regenerated and gets its suppleness and radiance back. The dynamic dermatological duo works to give you five core benefits: plumping up the skin, correcting signs of fatigue, long-lasting hydration, maintaining water in the heart of the cells and smoothing deep and fine lines. Perfect for keeping you feeling healthy and rejuvenated all through your hectic day! As the brand that first introduced collagen to cosmetic beauty, 127 years later Académie has maintained its core values of innovation, excellence and professionalism. Founded way back in 1890 by Dr Alexandre Lamotte, Maison Académie Scientifique de Beauté was, and still is, a complete skincare and beauty pioneer. They opened their first beauty salon way back in 1895, and have been winning awards ever since. 1936 they changed the game completely when they introduced collagen into a skincare cream formula. Since then, the family-run brand has gone on to launch sun protection products, the world’s first treatment foundation, their iconic Hydraderm cream, and in 1960, the first ever self-tanning lotion worldwide -Bronz Express. The spotlight is always on them in the industry for having products which are highly concentrated in active ingredients, ensuring exceptional results on the skin. You can place your trust in these experienced professionals, they’ve got you covered! The Académie Beauté range is available from select professional salons nationwide.